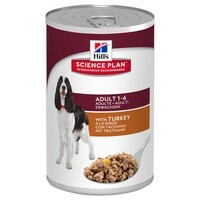 Hills Science Plan Advanced Fitness Adult Dog Food Tins (Turkey) have been developed to support lean muscles and healthy vital organs in adult dogs from 1 to 6 years of age. The food contains a precise balance of clinically proven antioxidants, lean proteins and omega 3 fatty acids to ensure your dog receives all the nutritional benefits they require to lead a long and healthy life. Balanced Sodium & Phosphorus Levels: Sustains healthy vital organs. High Quality Proteins: Supports lean muscle. Highly Digestible Ingredients: For optimal nutrient absorption. L-Carnitine: Helps to maintain optimum body weight and healthy, strong muscles. Antioxidants: Help maintains a healthy immune system. Omega 3 Fatty Acids: Help develop and maintain a healthy and shiny coat.